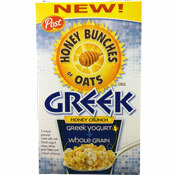 The complete name of this new cereal is Honey Bunches of Oats Greek Honey Crunch. I was expecting something fun and different. The way they write "Greek" on the box is just how they do it on the menu of a Greek restaurant I like. The box graphics might be slightly unique, but the taste is nothing new. The cereal is made up of very small flakes (that look like crushed traditional Honey Bunches of Oats flakes) and granola clusters - some covered in yogurt and some that are not. The predominate flavor is honey. The granola clusters have very little impact on the eating experience. You might notice a slight crunch every 3rd spoonful, but any flavor they might add gets lost and diluted within the combination of flakes and clusters. This cereal tastes and feels like traditional Honey Roasted Honey Bunches of Oats that's been crushed and drizzled with a bit more honey. That's not necessarily a bad thing. The taste is great. It's just not different. Only real negative happens at the end of a bowl. Because the flakes are smaller or crushed, the cereal's consistency starts to feel like oatmeal when it gets soggy. It still tastes fine, but it's unnerving to start with a bowl of cereal and end up with a bowl of mush. Nutritional Considerations: Each 1 cup serving of Honey Bunches of Oats Greek Honey Crunch has 230 calories, 3.5 grams total fat (1 gram saturated and 0 grams trans), 0mg cholesterol, 160mg sodium, 47 grams total carbs, 4 grams dietary fibber, 13 grams sugar and 5 grams protein. I just tried the Mixed Berry Variety of this cereal. It had a lot of berry flavor and was a little more interesting than the Honey Crunch variety. It was definitely my favorite of the two. Either I ate faster or I got a better batch because my bowl of the Mixed Berry cereal didn't break down into mush at the end. I'd give the Mixed Berry Greek cereal 5 out of 7 golden eggs. What do you think of Greek Honey Crunch? 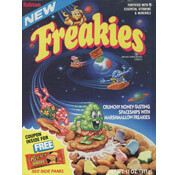 This is my favorite cereal EVER, but I cannot find it anymore. Please let me know what has happened.